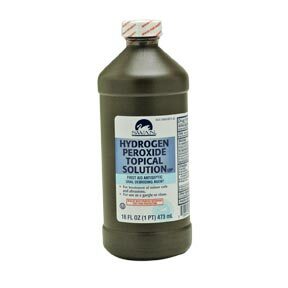 Hydrogen Peroxide is so versatile that it can also be used for many tasks in your home. Some call it the green alternative to chlorine bleach. Here are some great ideas that might make you grab an extra bottle or two for storage next time you shop. Mix up a 50/50 solution of hydrogen peroxide and tap water and pour it into a spray bottle. Use it to sanitize your kitchen counter tops, clean appliances and help keep your kitchen germ-free. Note: Mix up only as much as you’ll use at one time. If you don’t store hydrogen peroxide in its brown bottle, light will break down its chemical makeup. Mix up an ounce of hydrogen peroxide into a cup of water and spray your houseplants with this solution. It will help your houseplants grow greener and more lush. Add 1/4 cup to a sink of cold water. Add vegetables and fruits wash thoroughly and rinse with cool water. This will prolong the freshness and taste. Keep Hydrogen Peroxide out of direct sunlight and in a cool place. Store it in a dark bottle and remember to keep it out of reach of children. Please Note: Consult your doctor before ingesting hydrogen peroxide.